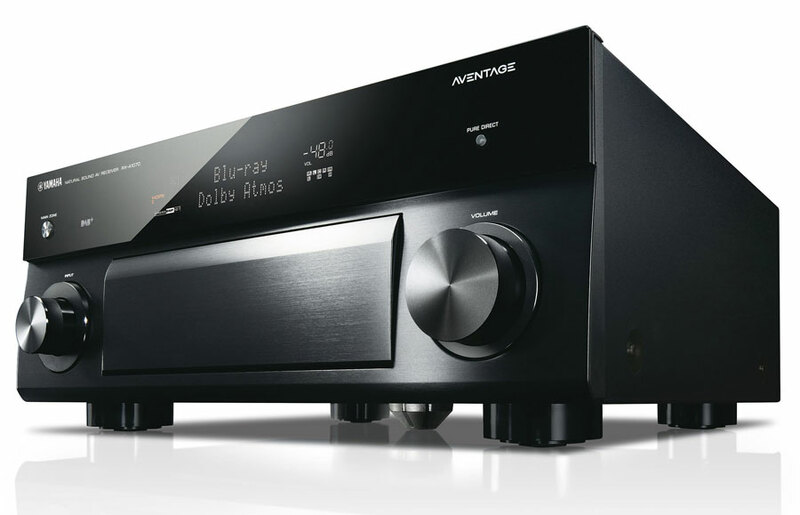 Enjoy immersive multi-channel sound with the Yamaha AVENTAGE RX-A1070 7.2-Channel Network A/V Receiver. It delivers up to 110W of power per channel at 8 Ohms and features Dolby Atmos and DTS:X compatibility for object-based audio support. Built-in Bluetooth and AirPlay support allows the receiver to wirelessly stream music from compatible sources, such as smartphones and tablets, while Yamaha's Compressed Music Enhancer helps to deliver optimized sound quality. Onboard Wi-Fi and Ethernet connectivity allows the RX-A1070 to access a variety of Internet-based music sources like Pandora and Spotify. It also supports DLNA content sharing when paired with your similarly equipped network-connected devices such as your computer. As an added convenience, you can download the free Yamaha AV Controller app to control the receiver from your Android or iOS devices. With eight HDMI inputs and two HDMI outputs, this receiver can act as a video switcher for your HD source components. It will pass through 4K video signals and upscale non-UHD signals to near-4K quality for enhanced viewing of lower-resolution sources when paired with a 4K display. The receiver also has a USB port for accessing media stored on USB flash drives. YPAO multipoint sound optimization will calibrate the receiver to your speakers and room setup for a tailored listening experience. S&I Verdict - The new Yamaha RX-A1070, high-end 7.2-channel receiver with it’s incredible audio capabilities and extensive video functionality is most certainly impressive. Audio excellence is assured! You won't be disappointed!